The most complete, up-to-date all-audio course available! If you have trouble finding time to fit in language lessons, All-Audio German is the perfect solution. Developed by the experts at Living Language, this program is designed for people on the move. You can learn German as you drive, do household chores, or work out at the gym. 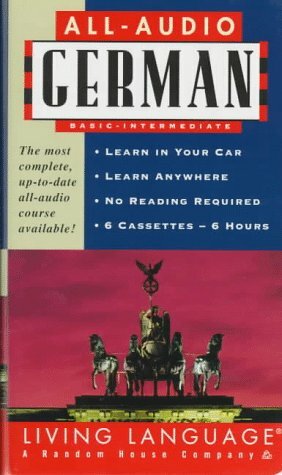 An English-speaking narrator guides you through the short, easy-to-follow lessons - all you have to do is listen and repeat after the native German speakers. No reading is required, but a listener's guide is provided if you want to look up spelling or grammar rules. Each lesson begins with vocabulary and some grammar basics before introducing a lively dialogue that includes the most current German idioms and usage. Interactive exercises reinforce what you've learned. You'll also find out some intriguing facts about German customs and culture. All-Audio German is a complete, thoroughly enjoyable learning experience! Speak German fluently with the most complete, up-to-date all-audio course available!